Lawrence Farmers' Market – Fresh. Fun. Local. Now Accepting 2019 Vendor Applications! To learn more, click on “Vendors”. The mission of the Lawrence Farmers Market is to provide children and adults in the Lawrence, KS area, with locally grown foods and farm products. This will be accomplished by improving access to local, healthy, affordable food through a direct farm-to-consumer marketing venue that will serve diverse populations, including those of low income. Other goals that the Lawrence Farmers Market strives to achieve are increased education and support of Lawrence-area agriculture. 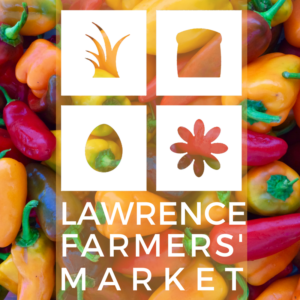 The Lawrence Farmers Market believes that small, local farms are essential to the local economy and is committed to making economic and educational connections between Lawrence-area residents and local farmers. Sign up for our E-Fresh Newsletter! Keep up with the latest seasonal produce changes, new product alerts, events, music, and more!